Spray 13x9-inch glass baking dish with cooking spray. Spread bread in baking dish. Sprinkle evenly with 1 1/2 cups of the cheese; mix lightly with bread. Sprinkle with tomatoes. In medium bowl, beat eggs, milk, mustard, basil and salt with fork or wire whisk; pour over bread mixture. Cover tightly and refrigerate at least 2 hours but no longer than 24 hours. Heat oven to 350°F. Bake uncovered 40 to 45 minutes or until knife inserted in center comes out clean. Meanwhile, in 10-inch skillet, cook bacon over medium heat 8 to 10 minutes, turning occasionally, until crisp; drain on paper towel. Crumble bacon. Sprinkle bacon and remaining 1/2 cup cheese over strata. Let stand 10 minutes before serving. Roma tomatoes aren’t as juicy as regular slicing tomatoes, but they hold their shape better during baking and cooking. For a holiday brunch, serve this breakfast casserole with sliced quick breads and a citrus fruit salad sprinkled with pomegranate seeds. 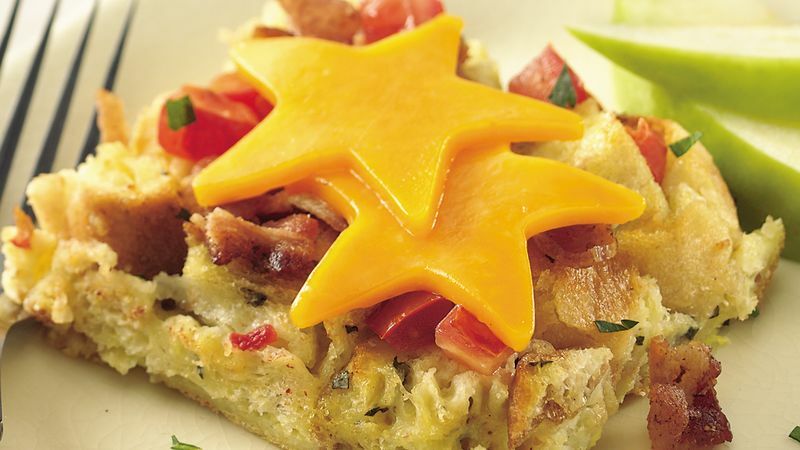 Instead of sprinkling with shredded cheese, arrange star-shaped cheese cutouts on top of the strata.